The other day I mentioned the joys of Conrad’s Bakery, located between Wingate, Crown Heights and Brownsville neighborhoods in Brooklyn. 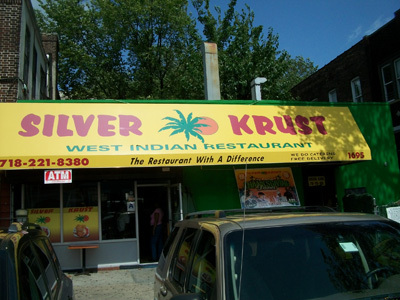 Another noteworthy joint in the vicinity is called Silver Krust, located at 1695 President @ Utica Avenue. Of the at least 2 dozen Jamaican or general Carribean joints spotted during the trip, it was the only restaurant doing brisk business during off hours. I wasn’t sure if the name was a knock off the Carribean chain Golden Krust, but competition is always welcome. Like most of the restaurants in the area they’re set up with steam tables. You can choose between items such as Oxtail, Goat, Chicken Feet and Tripe, Curry Chicken, and fish all served with rice and beans or plain rice. 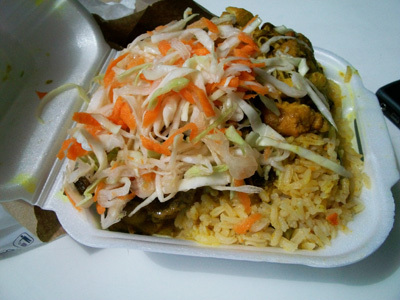 Additionally it comes with a side such as plantains, cabbage or vinegar based coleslaw. Because of the level of busyness I was a little nervous. A very imposing but friendly patron suggested the curry chicken. I got that along with coleslaw on top. The price was around $5. It’s a to-go place primarily with only two small tables outside. The patron who resembled a bouncer said bye and told me to “enjoy it.” Sometimes it’s the scariest people who are the nicest. The curry was mildly spicy and sweet. The coleslaw provided an excellent crunch as well as welcome acidity. It was a wonderful, unpretentious meal. I’ll be by Silver Crust again. Side note: They were sold out of patties – these will be sampled during a subsequent visit. On my way out I asked the cook who happened to step outside, if a picture of the restaurant would be okay. Without hesitating he said “It’s a free country. It’s free a country, my brother.” You can’t argue with that.